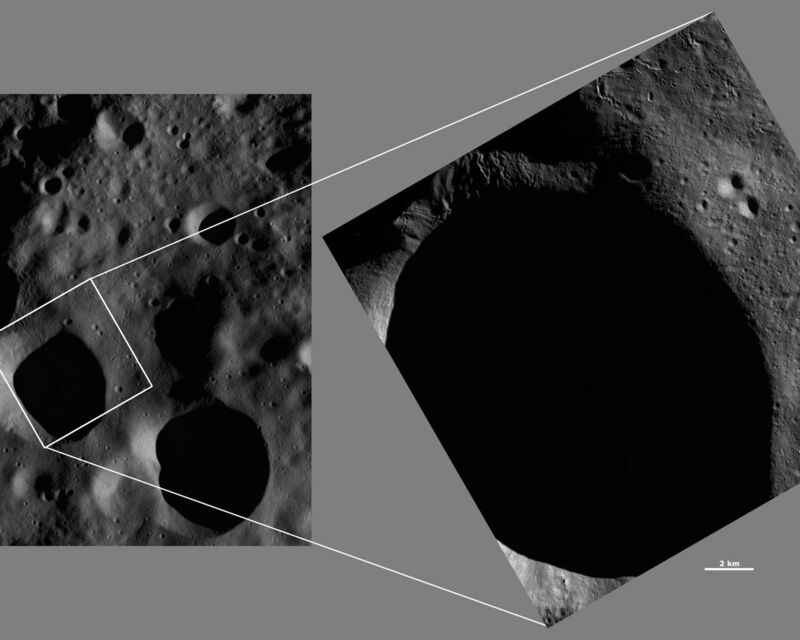 These Dawn framing camera (FC) images of Vesta show Floronia crater at both HAMO (high-altitude mapping orbit) and LAMO (low-altitude mapping orbit) resolutions. The left image is the HAMO image and the right image is the LAMO image. Floronia crater fills almost the entire LAMO image. The LAMO image is approximately three times better spatial resolution than the HAMO image. In images with higher spatial resolutions smaller objects can be better distinguished. Due to its location in Vesta's more heavily shadowed northern hemisphere much of the interior of Floronia is in shadow. 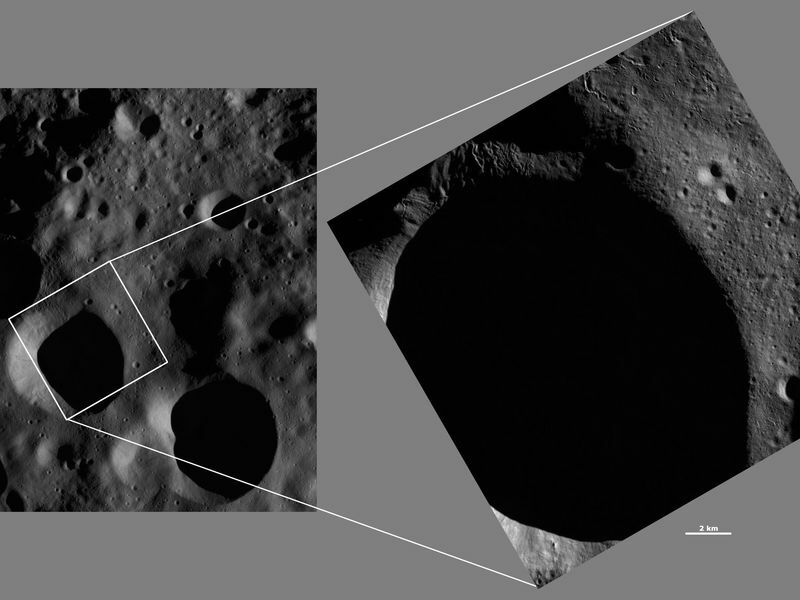 But, there are distinct sinuous grooves visible around the rim of the crater and in the top corner of the LAMO image. The long shadows that these grooves cast makes them easier to identify. 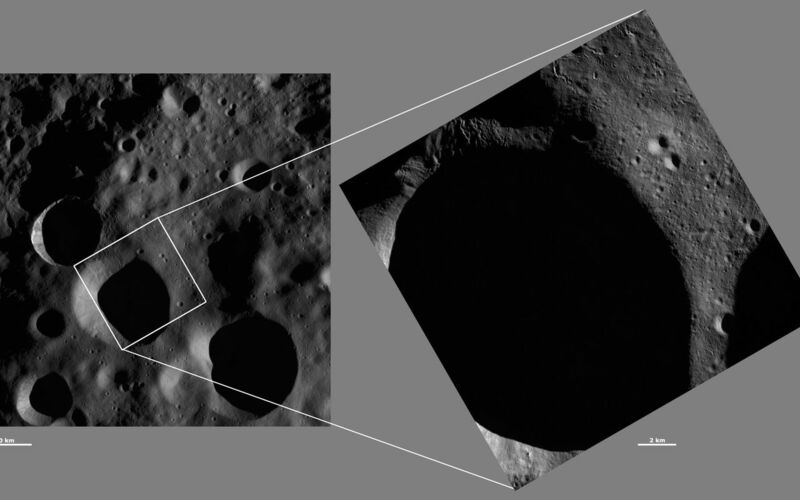 These images are located in Vesta's Floronia quadrangle, in Vesta's northern hemisphere. NASA's Dawn spacecraft obtained the left image with its framing camera on Oct. 24, 2011. This image was taken through the camera's clear filter. The distance to the surface of Vesta is 700 kilometers (435 miles) and the image has a resolution of about 63 meters (207 feet) per pixel. This image was acquired during the HAMO (high-altitude mapping orbit) phase of the mission. 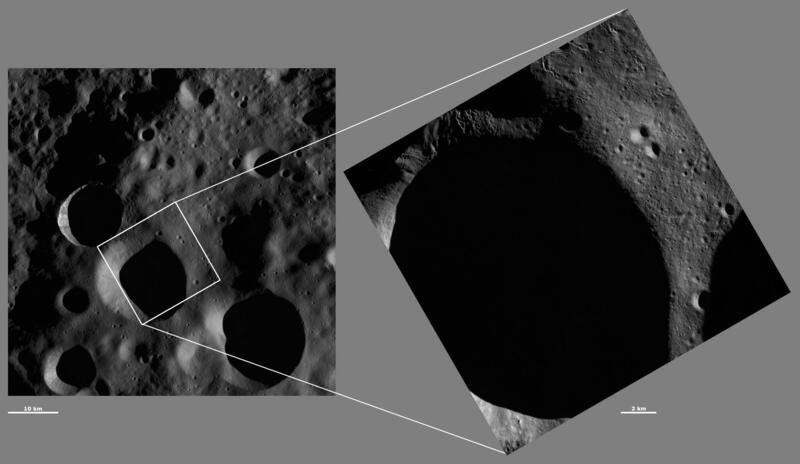 NASA's Dawn spacecraft obtained the right image with its framing camera on Jan. 10, 2012. This image was taken through the camera's clear filter. The distance to the surface of Vesta is 272 kilometers (169 miles) and the image has a resolution of about 18 meters (59 feet) per pixel. This image was acquired during the LAMO (low-altitude mapping orbit) phase of the mission.